Are you looking for a new dehumidifier? 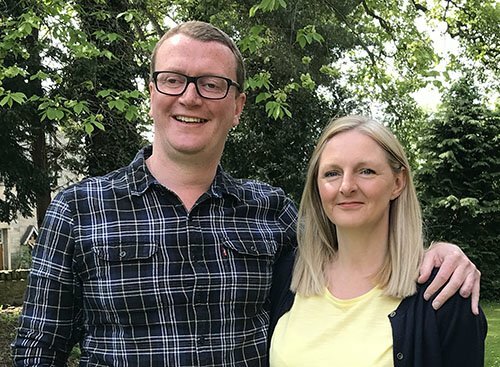 Whether its to reduce damp in your home, boat or caravan or to help dry clothes then we hope you will find this buying guide useful. We give advice on what to look for when buying a dehumidifier plus reviews of the best selling models. We also cover small or compact dehumidifiers. The reason we really like this dehumidifier is the way it offers good performance plus all the features you need, at a great price. The MK5 Classic has an RRP of £170 but can be available for just less than £160. So, this places it at around £20 more expensive than the EcoAir DD122 Simple, which comes with fewer features and analogue controls. When it comes to performance, the MK5 Classic has an extraction rate of up to 7 litres per day. The water tank capacity on this model is 2 litres, which is common at this price point and will mean you don’t have to empty the tank too often if in continual use. This dehumidifier can also be used between 1oC and 40oC, so is suitable if you intend to use in a cold conservatory or room over the winter months. The MK5 Classic is a desiccant dehumidifier so noise levels are relatively low at 34dB. However, the trade-off is higher energy consumption, which can vary between 390 and 630 watts depending on the mode and speed selected. This EcoAir model has a neat electronic control panel (rather than rotary controls that are found on cheaper models). There are 3 dehumidifying modes on this model – High, Economy and Auto settings, with each mode, automatically shutting off the dehumidifier when the preset humidity level is obtained. The auto mode is good at combining optimum energy efficiency with quiet operation, whereas the high speed setting is ideal for when the dehumidifier is first used in a very damp room. If you are looking to use this dehumidifier to dry your washing, then the MK5 Classic has two laundry modes. There is a quick and normal drying mode (this works by removing moisture from the damp clothes), although the quick mode should be used in moderation otherwise it could result in high electricity bills. This EcoAir dehumidifier has a timer function which is very useful if you want to leave the dehumidifier unattended or use in a room during the night. You have to choose between 2, 4 or 8 hour timer settings but this should cover most needs. The MK5 Classic also has a built-in ioniser that will (by recharging negative ions) give you improved air quality. A separate ioniser will probably work better but it’s a nice extra feature that EcoAir have included. One thing you may want to do with your dehumidifier is moved it from room to room and this is where the MK5 Classic’s 6kg weight and an integrated carrying come in handy, although this model does not feature any movable castor wheels. Good points: All the features you’ll probably every need. Good extraction rate. Not the cheapest but offers good value for money. Also includes 2 year guarantee. Not so good: There are no major negatives with the MK5 Classic. For this price, we would not expect any more features. Overall: This is a bestselling and highly rated dehumidifier, and for good reason. The price, features and spec on this model are what makes it our current best buy dehumidifier. The EcoAir DD122 Simple dehumidifier is currently one of the top selling dehumidifier on Amazon.co.uk. It’s easy to see why as it matches good performance, a reasonable price and includes the features that you really need. 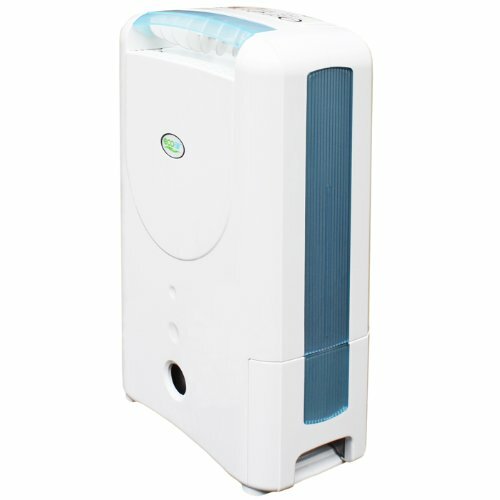 Typically priced at under £150, the DD122 Simple is a desiccant dehumidifier that is relatively quiet at a maximum 34dB. Extraction is rated at 7 litres per day and the unit has a 2 litre water storage tank. You will have to remember to empty the tank throughout the day if used continuously, although as a safety measure, the dehumidifier will turn off if the tank gets full. Another option is to connect a hose so that the unit can continuously drain. The DD122 Simple has a rotary humidistat but misses out on a timer function. It does feature a continuous laundry mode function for drying clothes and also a “turbo” setting for instances of high humidity or severe damp. In terms of portability, it’s fairly light at 6kg plus the DD122 Simple has an integrated carrying handle. In summary, the DD122 does all you would want from a dehumidifier at an affordable price, so it’s easy to see what it’s a bestselling and highly rated model. 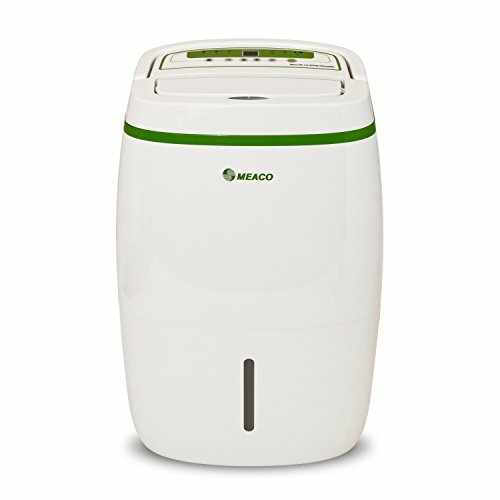 Despite costing considerably more than the two bestselling EcoAir dehumidifiers, the Meaco Platinum is still a very popular model. Why does it cost nearly £230? The big difference between the Meaco and the EcoAir models is the extraction rate: this is an impressive 12-20 litres per day (depending on temperature and relative humidity) compared to 7 litres for the EcoAir units. This makes the Meaco suitable for use in larger homes. This dehumidifier also features a much larger 6 litre water storage tank, although this can get quite heavy when full. The Meaco Platinum has a neat digital control panel that includes a humidistat plus a 1-24 hour timer. For portability, the Meaco features castor wheels and a carrying handle, however, it is considerably heavier than the EcoAir models, weighing in at nearly 13kg (more than double that of the EcoAirs). Being a larger dehumidifier, it’s also noisier, with a claimed maximum noise level of 46db (35% more than the EcoAir models). If you need to use a dehumidifier in a larger home, then the Meaco Platinum 20 litre is well worth considering. However, if your requirements are less, then opt for one of the EcoAir models and benefit from the lower price, noise and increased portability. This buying guide covers what are classed as small, mini or compact dehumidifiers. This description not only relates to the overall size of the dehumidifier but also one of the key dehumidifier attributes: moisture extraction rate; due to their smaller extraction rate, these dehumidifiers are only really suitable for use in smaller rooms (for example kitchens or bathrooms), garages or in caravans or boats. When looking at the bestselling compact dehumidifiers on Amazon, there is actually little choice in the Top 5, as 3 of these are actually the same unit but sold under different brand names, so we’ll cover these first. Moisture extraction rate on all these similar units from Pro Breeze, Duronic and Airpro is the same 500ml per day (compared to typical full size dehumidifiers that have an extraction rate of around 7-12 litres per day). Water tanks are also the same at 250ml, except the Pro Breeze 1500ml which has a larger 1.5 litre water tank. All water tanks are removable from the front of the units to make emptying easier. These are also very compact and lightweight units. The models with 250ml water tankers are on around 21cm in height with a weight of just over 1.2kg, making them easy to place anywhere in your home. Don’t expect many features on these dehumidifiers though. For this price you are basically limited to a single speed dehumidifier, at least they all have an auto-shut off feature should the water tank get full. All models come with a separate power adapter but please note that these are not suitable for use in cars as they do require a mains power supply. 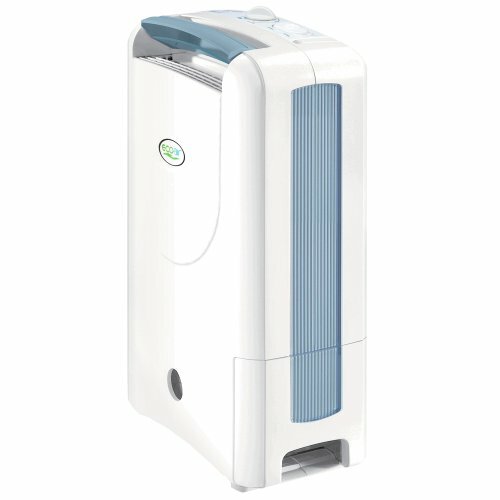 What small dehumidifier would we recommend? As three of the five bestsellers are the same model then it really comes down to: do you have a preferred brand, what colour do you prefer or essentially, price. For us, we would give the Mpow a miss as we cannot really justify paying the higher price for looks alone. 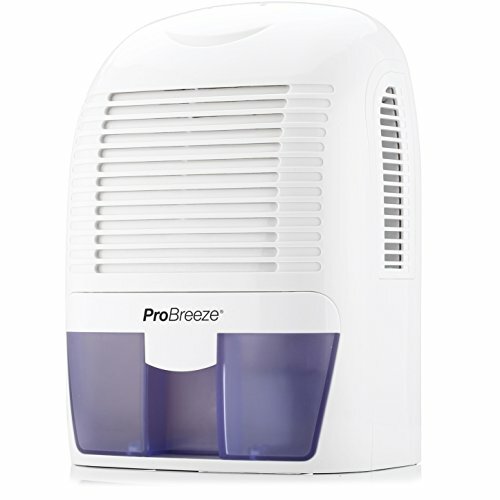 The Pro Breeze 1500ml (with its larger capacity water tank) generally costs around twice as much as the 250ml tank models. This may seem a lot, but if are using a dehumidifier regularly then this larger (6 times more in fact) water tank capacity will mean you can let it run for longer unattended and without the need for continual emptying. The dehumidifier moisture extraction rate is high on the list of key dehumidifier buying criteria as this determines whether it is suitable for the chosen room size or area. Extraction rate is usually quoted in litres per day however comparing extraction rates between manufacturers is not always straightforward. Why? Manufacturers quote extraction rates at different temperature and humidity levels so a direct comparison can be harder (although comparing between a manufacturer’s models is simpler). A mini dehumidifier with an extraction rate of less than 1 litre per day is only really suitable for very small rooms, caravans or boats. For most domestic applications a dehumidifier with a 5 to 20 litres per day extraction rate will be sufficient, with the lower extraction models being more suitable for smaller homes. Energy use can be a concern when buying a dehumidifier, especially if you plan to use for long periods of time. On average, power consumption on compressor models is around half that of desiccant models. Desiccant models also consume more power when on full speed mode. The best thing is to look for models with a timer function or a humidistat that turns the dehumidifier off when a certain humidity level is reached. It is important to check the noise level, especially if you plan to use in a bedroom overnight or one of your main house rooms. Compressor models are usually slightly noisier than desiccant models but overall, when used on a low setting, dehumidifiers are fairly unobtrusive appliances when it comes to noise. Portability – How do you intend to use your dehumidifier? Does it need to be moved from room to room? Does it only need to be brought out of a garage during certain months? Most domestic dehumidifiers weigh in at around 10-12kg, so check the dehumidifier weight if this may be a problem. Also look out for castor wheels and carrying handles for extra portability. A mini dehumidifier can be purchased for around £30, but these have a low extraction rate and are only suitable for very small spaces. A typical domestic dehumidifier will cost around £120. Spending more than this will get you more features plus higher extraction rates and sometimes lower noise levels. More info: If you are considering purchasing an air purifier, check out our buying guide here.